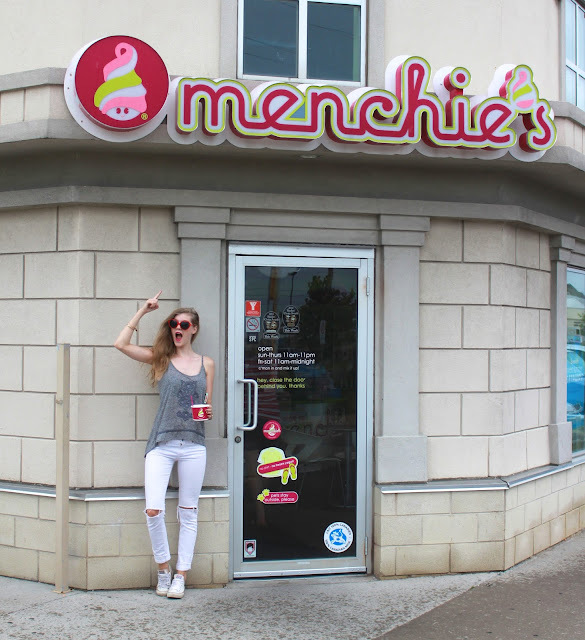 I recently became one of the brand ambassadors for Menchie's Canada and I'm helping promote Menchie's newest contest this summer. If you head over to my Instagram @sydhoff3 you will see how to take part in this giveaway where you can win a Menchie's summer VIP pass. This pass includes 7 complementary visits to any Menchie's locations across Canada. This giveaway is so much fun! All you have to do is tag myself and Menchie's Canada in your social media post showcasing your Menchie's creation with the hashtag #MenchiesMyWay. Considering myself and most people I know already post their Menchie's creations on the daily, this contest is so easy and fun!! My favourite locations are the one in Whitby and downtown on Bloor St.
You have until August 31st, 2015 to upload your #MenchiesMyWay photo. The winner will be selected based on how creative your Menchie's is, so head on out to your local Menchie's spot and get creating!!!! 1. In the summer of 2015, Menchie’s will have 116 locations across Canada and are planning to have another 9 by the end of the year . 2. The new Oreo cookie flavour is now one of over 150 flavours available at Menchie’s. Yum! Can't wait to check out the contest details - thanks for hosting!